‘Old soldiers never die, they just fade away’, is a famous saying but the name of Brig Kuldeep Singh Chandpuri, a national hero of 1971 Indo-Pakistan war will never fade away. It will remain etched in golden letters in the annals of military history. The war veteran died in Chandigarh at the age of 78 last Saturday. He had become an iconic army officer who had not given in to pressure and blunted a major enemy offensive in Rajasthan with a handful of soldiers. His legendary role in Laungewala battle stands out as the epitome of innumerable acts of bravery by junior leaders and soldiers under them. A true patriot, as a company commander on a forward post in Ramgarh- Jaisalmer Sector, he exhibited raw courage of an exceptional order and remained cool, calm and composed in his resolve to hold his defences in face of heavy armour led attack by the enemy. The grand strategy in 1971 Indo Pak war was to seek a decision in the Eastern Sector to attack East Pakistan (now Bangladesh) from three directions with pincer movements heading towards Dacca. On the Western front, while maintaining a defensive posture limited attack were planned to be launched to improve our position on the bargaining table in peace talks post the war. On the other hand, knowing that they would be unable to affect the war in the East, Pakistanis had planned to capture large chunks of territory in Ramgarh- Jaisalmer Sector of Rajasthan in order to trade them for areas lost in East Pakistan. On the night of 4/5 December 1971, Pakistan launched a massive attack with 51 Infantry Brigade, supported by a regiment of T-59 tanks and a squadron of Sherman tanks with the aim to capture Laungewala and Ramgarh. A Company of 23 PUNJAB led by then Major Chandpuri held fast and despite being heavily outnumbered at the scale of twenty to one, beet back successive attacks throughout the night. In wee hours of the morning of 05 December, Capt YP Bhatia linked up as reinforcements to Laungewala with D Company of 17 RAJRIF (Sawaimans) and four AMX 13 tanks. His company officer 2 Lt DR Singh had accompanied him. After first light, the Indian Airforce destroyed the stranded enemy tanks in precision attacks and left a graveyard of superior enemy tanks in the biggest tank battle in the deserts after independence. Unfortunately, one enemy tank destroyed one of our AMX 13 tanks with all four crew members becoming martyrs. 23 PUNJAB had three soldiers martyred and five camels killed. Major Chandpuri was awarded Maha Veer Chakra, the second highest award for gallantry. The company was awarded six other awards. In the deserts the defences are held in a nodal point concept by occupying dominating sand dunes astride communication centres. This node has civilian population and sweet water and is generally stocked with ammunition and food to fight a prolonged battle for seven to ten days. Widely spaced companies deployed astride the limited road and track axes, operate almost independently with the battalion commander practically unable to affect the battle of the node at night. Therefore, this isolated action of a company group of 120 highly motivated individuals with an effective and competent leader held their ground in spite of nearly 2800 attacking soldiers of the enemy supported by 50 tanks. They improvised in the short warning period and dug a longish communication trench /ditch all along the periphery of the post in order to move troops freely from one direction to the other. They also managed to lay wire obstacles which cautioned the assaulting enemy tanks who thought they had hit a minefield and they continued to fire from a distant in a static manner. 2 Lt Dharambir with his protective patrol of 20 men was able to give early warning of the enemy build up and move. The anti-tank guns, rocket launchers, 81 mm mortars and 7.62 MMGs were able to hit a large number of tanks and soldiers putting further caution on the enemy commander’s mind. The Air Force did not have night flying capabilities in that sector and the ground reinforcements were also delayed due to the terrain. Commissioned into 3 PUNJAB after passing out of Officers Training School (Now Academy), Chennai in 1963, 2 Lt Kuldeep Singh got his grooming in the then two hundred year old unit and learnt the ropes from his senior officers as well as Junior Commissioned Officers and men and shaped up as an all-rounder, efficient and effective regimental officer. An outstanding football player, he was a qualified judge in 20 km walk and represented the country in Commonwealth, Asian and Olympic Games as an official. 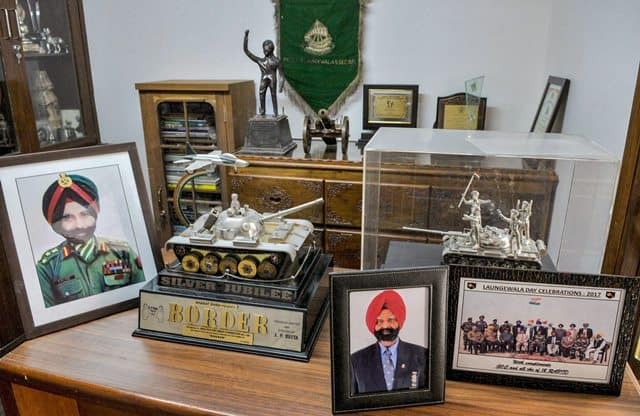 He joined a newly raised battalion 23 PUNJAB shortly before the war but with his personal example, was able to create his company as a cohesive and competent team in no time. Befitting tribute to an Infantry soldier, who lived life king size .